Finally! 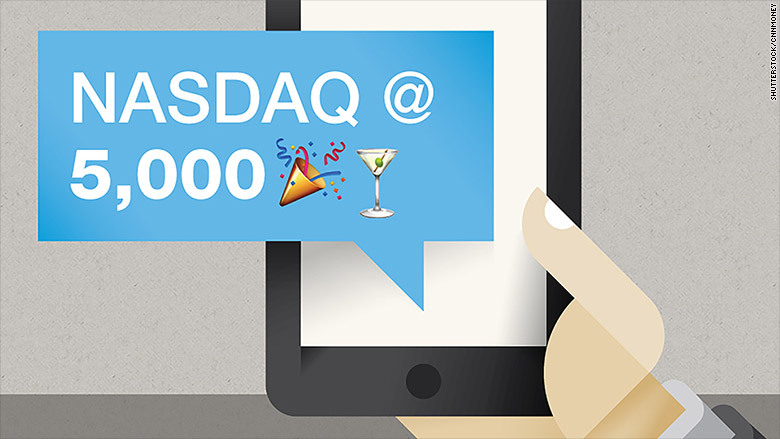 The Nasdaq topped the 5,000 level Monday for the first time since March 2000. 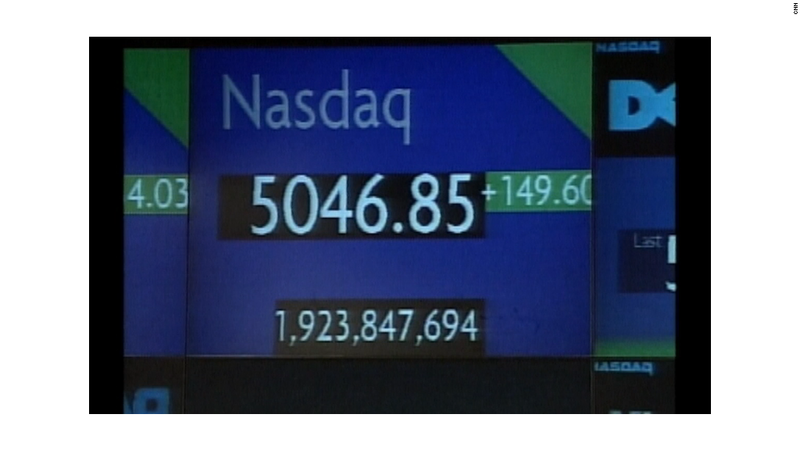 The Nasdaq closed at 5,008. It is only the third time it has ever finished above 5,000. Believe it or not, the Nasdaq is now just 2.4% from the all-time peak of 5,132.52 it notched during the Dot-com bubble. More records: Stock markets around the world have been crushing records lately. The Nasdaq, home to Apple (AAPL), Microsoft (MSFT), Google (GOOGL), Intel (INTC) and many other prominent tech stocks, is actually the laggard. It's the last major index to come close to its all-time highs. The Dow and S&P 500 have been routinely hitting new records for the past year. A lot of people have concerns that this might be a warning sign that stocks are back at lofty levels again, but much is different now versus the Dot-com era. Many of the companies leading the charge this time are well established and have a lot of cash on hand. Apple has more than $175 billion in cash, for example. And the stock is only trading at about 15 times earnings estimates for this fiscal year. In 2000, some leading tech companies were valued at more than 100 times profit forecasts. History lesson: Tech stocks plummeted in 2000 as prices for technology companies, particularly relatively new Internet firms, got way too high in a relatively quick fashion. It was a classic bubble. Several Internet stocks went out of business because they spent too much and did not have solid business plans. Who could forget the likes of Pets.com and its sock puppet in a Super Bowl ad? The plunge was breathtaking. 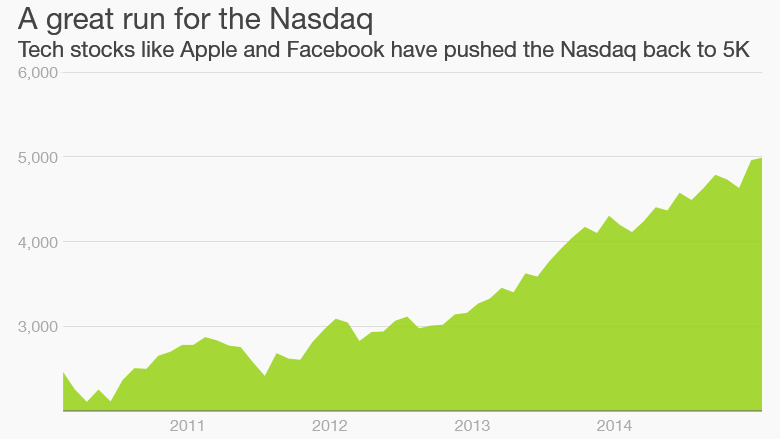 By October 2002, the Nasdaq had fallen to around 1,108 -- nearly 80% below its all-time high. But tech stocks have come roaring back since the broader market bottomed nearly six years ago during the Great Recession. The mobile and social media revolutions have helped lead the way as Apple, Google and Facebook (FB) have all emerged as some of the leading tech companies in the world. Deja vu all over again? Still, there are some eerie comparisons to15 years ago. Apple is now worth more than $750 billion and some experts are predicting that the company will one day top the $1 trillion market value level. Back in 2000, many were saying the same thing about Cisco Systems (CSCO). That didn't happen. Cisco is no slouch. It's even in the Dow. But its stock has not gotten back to 2000 levels. Its market value is $150 billion. Even though a lot of the leading publicly traded tech companies are trading at reasonable valuations, the same can't be said for all firms. Twitter (TWTR) and Netflix (NFLX) trade for more than 125 times earnings estimates for 2015. Electric car maker Tesla (TSLA) is valued at about 200 times this year's profit forecasts. Some hot, private startups -- companies that could one day go public -- are also raising money from venture capitalists that make them worth staggering amounts of money. Uber is the poster child for a possible bubble in Silicon Valley. It's worth more than $40 billion. Snapchat, Airbnb and Dropbox are all valued at more than $10 billion. So is SpaceX, the rocket company founded by Tesla CEO Elon Musk.